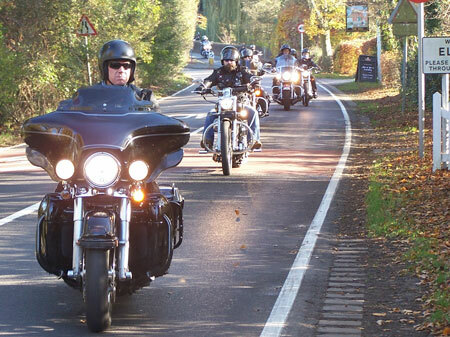 Scottie and I reckon that this is the 8th Remembrance Ride in its present format, and judging from Sunday’s turn-out, we have no plans to amend it any time soon. Once again a deeply impressive turnout of literally everything from 883s to Ultras gathered at 611 King’s Road for an early 9am briefing - we need to start that early to avoid the closure of the New King’s Road from 10am for the Parson’s Green assembly, we don’t just do it out of spite. 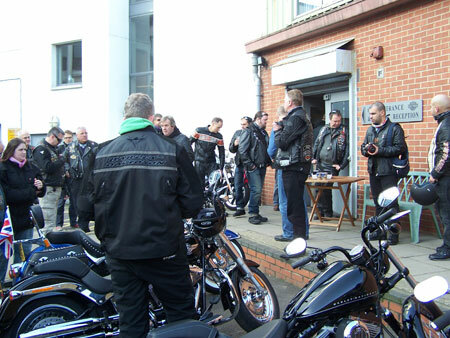 A total of 39 people booked in, and enjoyed John Warr’s hospitality and breakfast coffee and croissants, including the legendary Ian Mutch from MAG on his very well-travelled Super Glide. We had recce’d the route on the previous Thursday, and believe me the country lanes from Effingham to Forest Green were SLIPPERY. My Softail does not benefit from ABS like Scottie’s Ultra and in places the roads were marginal, so the briefing was more safety orientated than usual. However we all listened carefully, even the guest arriving a few minutes late on the blue Ultra (once he turned the music off!). The plan was, once again, extremely simple: escape from London on the A3 as far as the M25 turnoff; off onto the back-roads at Ockham Common, and then navigate via Martyr’s Green to cross the A246 at Effingham. Then on to the really slippery stuff, including that downhill hairpin near Dunley Wood, where the North Downs Way crosses our route. All safely negotiated, we briefly joined the A25, then left up through Abinger Hammer, Holmbury St Mary (where I used to shoot pheasant) and the coffee stop at The Parrot, Forest Green. At 11am, after coffee, a dignified two minutes silence was observed. We then remounted and set off down the Ockley Road, and into Cranleigh where an over-running parade led to an unscheduled and un-reconnoitred detour. A great winding addition to the intended route took us through Cox Green to rejoin the A281 Horsham to Guildford Road a good few miles and minutes later than planned. Never mind, we soon got back on track towards Dunsfold aerodrome, home of the fabled Top Gear programme. 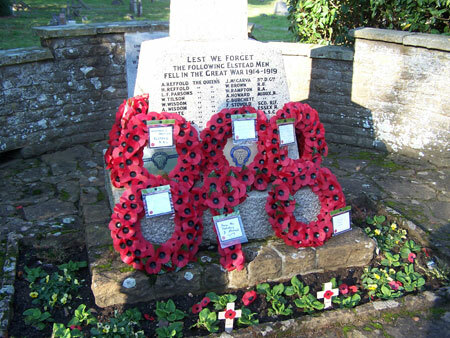 By hook or by crook we achieved a crossing of the A3 and from then it was only a short hop to the Elstead war memorial where we laid a wreath on behalf of Chelsea & Fulham H.O.G. I then read a favourite poem, ‘In Flanders Fields’ by John McRae. 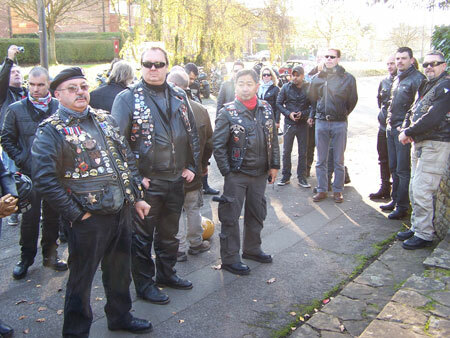 On gathering to leave, we were approached by a gentleman who identified himself as the chairman of the Elstead branch of the Royal British Legion, who was interested to learn why a bunch of bikers were laying a wreath. Once we explained that there was a strong service connection, not only with the founders of Warr’s but also with many of our members, and that we were laying the ‘Old Contemptibles’ wreath for Fulham RBL all was smiles and expressions of gratitude for a continuing tradition. Just round the corner was lunch at The Mill at Elstead, a drink in the unseasonably warm sunshine (no repeat of last year’s driving cold rain) and then home in time for tea. Many thanks to Chapter Safety Officer Scottie, for leading and arranging, and Road Captains Les and Nick for their support. Once again I had the privilege of being ‘last man’ and the first aid kit rested unused in the T-bag.